Waaaaaah ! 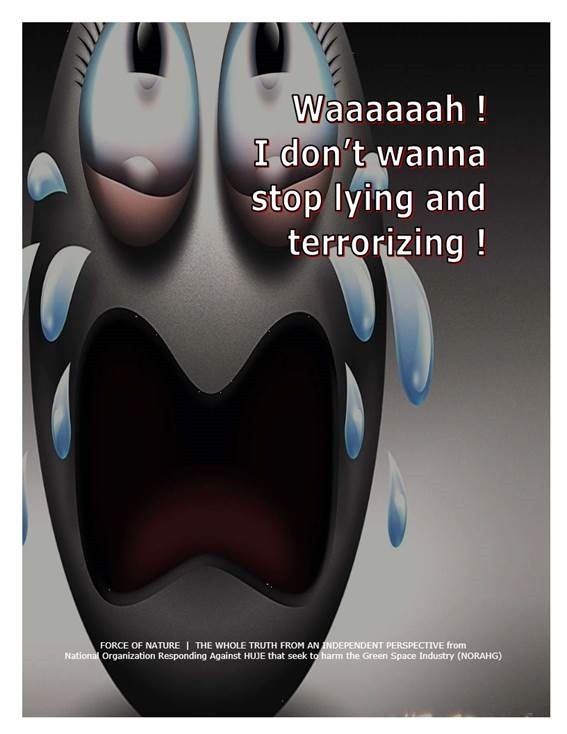 I Don’t Wanna Stop Lying And Terrorizing ! Anti-Pesticide & Environmental-Terrorists Make Sniveling Demands For Protection For Their Lies & Conspiracies ! Let These Fanatical-Activists Feel The Terror Of The Courts ! On October 28th, 2015, the Government of Ontario IMPOSED Bill 52, the Protection of Public Participation Act, which bans SLAPP, the Strategic Lawsuit Against Public Participation. According to Anti-Pesticide & Environmental-Terrorist Organizations that operate in Ontario, lawsuits that are intended to CHALLENGE THEIR ACTS OF SUBVERSION are actually a form of censorship and intimidation by burdening them with the cost of a legal defense until they abandon their criticism or opposition. The SNIVELLING AND CRYING Fanatical-Activists who operate these organizations will now be able to LIE AND TERROIZE WITH IMPUNITY ! They are lunatics who have the means to LIE, but NO REAL FACTS to LIE with ! These organizations MISLEAD THE PUBLIC by WRONGFULLY ALLEGING that they are on some kind of mission to bring honesty, integrity and good public policy. In fact, these organizations SERVE ABSOLUTELY NO USEFUL PURPOSE TO SOCIETY ! These Anti-Pesticide & Environmental-Terrorist Organizations have INFLICTED HORRENDOUS AND CATASTROPHIC CARNAGE, as well as TERROR, DESPAIR, and DESTITUTION, against THOUSANDS of hapless victims throughout the Professional Lawn Care Industry. These organizations have CONSPIRED TO IMPOSE ARBITRARY PROHIBITION against pest control products used in the Urban Landscape. Because of the Fanatical-Activists who operate these organizations, we are living in the 9|11 Era of Anti-Pesticide Terrorism ! 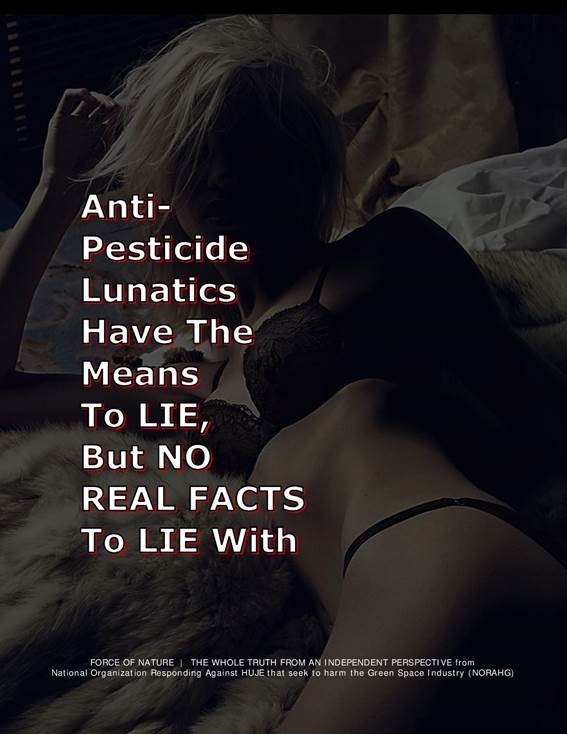 As shown on a WEB-PAGE on The Pesticide Truths Web-Site, every single organization is EITHER OPERATED OR INFESTED with Anti-Pesticide Lunatic-Terrorists ( a.k.a. activists ) who have CONSPIRED TO ARBITRARILY PROHIBIT against pest control products used in the Urban Landscape. The Ontario Civil Liberties Association has called upon Ontario’s Attorney General to go further, as Bill 83 does not correct fundamental flaws with Ontario’s defamation law which impose a one-sided burden of proof to force defendants to disprove falsity, malice, and damage within a very limited framework where « truth », « privilege », « fair comment », and « responsible reporting » are their only recognized defences. It is ironical that those Fanatical-Activists who operate Anti-Pesticide & Environmental-Terrorist Organizations are FEIGNING MOCK-OUTRAGE AND MOCK-TERROR over possible CRIMINAL CHARGES. How else can they face the consequences for their ACTS OF SUBVERSION ? These SNIVELLING AND CRYING Fanatical-Activists have themselves created HARM and TERROR against several industries through their CONSPIRACIES TO ARBITRARILY PROHIBIT against pest control products. These products are, in fact, SCIENTIFICALLY-SAFE, and will NOT CAUSE HARM TO PEOPLE, ANIMALS, OR THE ENVIRONMENT. The DEPRAVED INDIFFERENCE of these Fanatical-Activists is itself a form of TERROR against industries such as Professional Lawn Care Industry, Golf, and Agriculture. As a reward for CONSPIRING FOR ARBITRARY PROHIBITION, these Fanatical-Activists have acquired some INFAMY, CELEBRITY, and POWER, and have attracted MILLIONS OF DOLLARS to their coffers in the form of GOVERNMENT GRANTS and PUBLIC DONATIONS. The DEPRAVED INDIFFERENCE of these Fanatical-Activists has led to LOSS OF REVENUES, BUSINESS FAILURES, BANKRUPTCY, and UNEMPLOYMENT. They have already INFLICTED TERROR, DESPAIR, and DESTITUTION ON THOUSANDS OF HAPLESS VICTIMS throughout the Professional Lawn Care Industry. These Fanatical-Activists are experts in AVOIDING the consequences of their SUBVERSIVE ACTS OF TERRORISM. These Fanatical-Activists have gone to great lengths to create SHIELD ORGANIZATIONS in order to ensure that NO actions could be attributed to them personally. Additionally, when faced with the consequence of CRIMINAL CHARGES, these SNIVELLING AND CRYING Fanatical-Activists run to the Government of Ontario for help and support. They are FEIGNING MOCK-OUTRAGE AND MOCK-TERROR that the Government of Ontario has NOT THEM HELPED ENOUGH, through The Ontario Trillium Foundation ( OTF ). Trillium is a FINANCIAL AGENCY created by the Government of Ontario and the McGuinty-Regime to PROVIDE VIRTUALLY LIMITLESS FUNDS to Anti-Pesticide & Environmental-Terrorist Organizations ! It is ironical that Fanatical-Activists could nevertheless defend themselves in court with the MILLIONS OF DOLLARS THAT HAVE BEEN UNJUSTIFIABLE PROVIDED TO THEM by The Ontario Trillium Foundation. It is ironical that Fanatical-Activists, who themselves have TERRORIZED COUNTLESS NUMBERS OF HAPLESS VICTIMS, now feel terrorized themselves. Still unrepentant, Fanatical-Activists are SCORNFULLY DEROGATORY and MALICIOUSLY RETALIATORY towards anyone who does not agreed with their dogma. Those who operate Anti-Pesticide & Environmental-Terrorist Organizations have gone so far as to have people terminated from their employment. Those who operate Anti-Pesticide & Environmental-Terrorist Organizations have gone so far as to practice CIVIL DISOBEDIENCE and HARASSMENT against the Professional Lawn Care Industry, the Golf Industry, and the Agriculture Industry. These Fanatical-Activists are MASTER-TERRORISTS ! Those who operate Anti-Pesticide & Environmental-Terrorist Organizations have repeatedly claimed that they are the SOLE DISPENSER OF THE WHOLE TRUTH regarding pest control products. And … they RETALIATE against any of their detractors. These Fanatical-Activists are also INTELLECTUAL-TERRORISTS ! By challenging their dogma, it does not mean that you are endangering the future of our planet. What we are dealing with here is not the intellectual superiority of those who operate Anti-Pesticide & Environmental-Terrorist Organizations, but rather, INTELLECTUAL TERRORISM ! Intellectual AND Environmental Terrorism ! Those who operate Anti-Pesticide & Environmental-Terrorist Organizations are MASTERS in the art of TERRORIZING legitimate and tax-paying businesses, as well as the public at large. • If you use pest control products, people will get cancer. • If you apply fertilizers, you are polluting the lakes. • If you say that the environmental movement is too alarmist, you don’t give a damn about our planet. • If you water your lawn, there will be no water left for us to drink. • If you use any insecticide, the birds and bees will die. • If you use a herbicide, our children will become mutants. • If you use a fungicide, golfers will die. • If you use an organic fertilizer, people will die. • If you don’t support global warming, you condemn us to a horrible death. • If you do support the return of DDT, you are stupid. • If you are a professional turf manager simply trying to grow grass, you are an enemy of Fanatical-Activists, and they will hurt and harm your livelihood. Those who operate Anti-Pesticide & Environmental-Terrorist Organizations have made an enemy of the Professional Lawn Care Industry, the Golf Industry, and the Agriculture Industry. They must now face the consequences for their actions. Unless the Government of Ontario protects them some more. Otherwise, the INDUSTRY WILL STRIKE BACK against Anti-Pesticide Activists. There is NO RECOURSE but OFFICIAL COMPLAINTS AND LITIGATION against these Pesticide-Hating Fanatical-Activists. 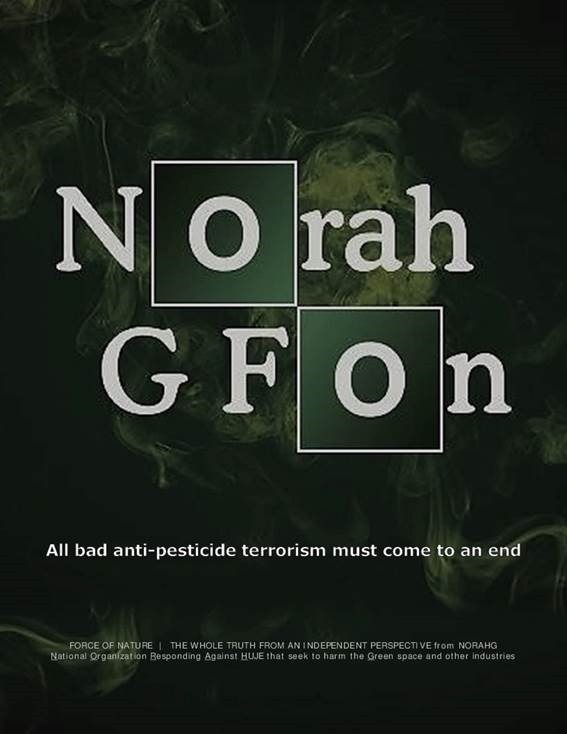 NORAHG manages a VAST ARCHIVE of REPORTS, MEDIA REFERENCES, AUDIO CLIPS, and VIDEOS on ALL Anti-Pesticide & Environmental-Terrorist ACTS OF SUBVERSION. We know who they are, and where they are hiding, and what they have said and done. We will HOUND THESE VERMIN FOREVER, no matter where they slither off to. LET THESE PEOPLE FEEL THE SPOTLIGHT OF SCRUTINY AND THE TERROR OF THE COURTS !